At the end of the tour, semi luxury accommodations will be provided. This camp site would be either close to a lake river or aborigine inhabitant area. Meals is being provided to the visitors and provided according to the Sri Lankan tradition. These camp sites are conducted under high security. This safari offers the chance to see some of the Sri Lankan 92 mammals and 16 endemic species. 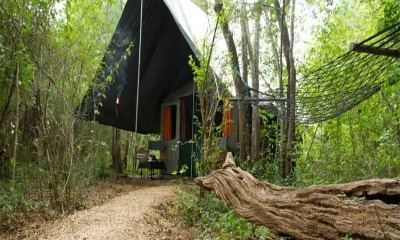 Yala National Park is believed to have the worldâ€™s biggest concentrations of Leopards and bears. Udawalawe National Park is famous for its elephants. But Minneriya National Park hoasts the awesome dry season â€œGatheringâ€ in which herds of elephants congregate to drink the regions remaining water. Apart from the above, many species of other animals could be watched in these areas.